One person has been shot in Charlotte, North Carolina protests against the fatal police shooting of Keith Lamont Scott. Riot police are firing tear gas into the crowd. The governor declared a state of emergency and ordered in National Guard and state troopers. 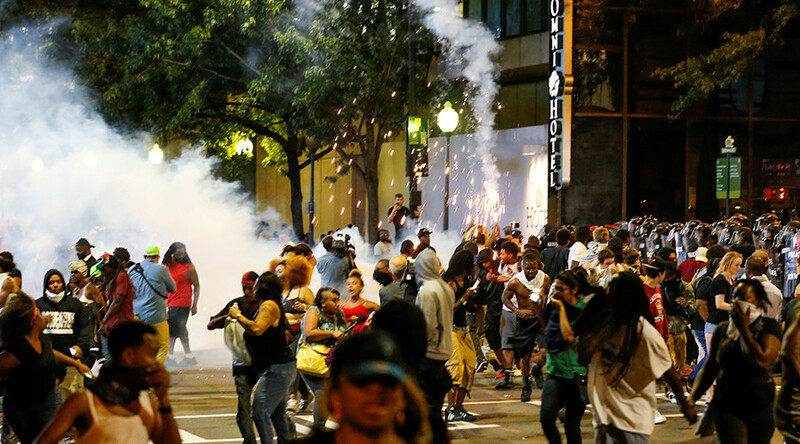 Peaceful protests turned violent on Wednesday, night two of demonstrations in Charlotte. Along with one person being critically shot in the head, there are reports of stores looted, windows broken, and reporters on scene threatened and assaulted. The Charlotte-Mecklenburg Police Department declared the protests an "unlawful assembly" and announced their willingness to use "non-lethal instruments" to control the crowd, estimated to be in the hundreds. WCNC reported medics confirmed a gun shot wound on the corner of College and Trade. The victim had life-threatening injuries, and was confirmed deceased by Police Chief Kerr Putney, but that report has been corrected. The victim is in critical condition on life support, according to the city government. The City of Charlotte is confirming no officer was involved in the shooting. Some protesters on scene, however, claimed police shot a man throwing bottles. Four police officers have been injured, all with non-life threatening injuries, Charlotte-Mecklenburg Police Department wrote on Twitter. WCNC posted video of a scuffle between police and protesters, saying that one person appeared to have been detained by authorities at scene. Close to midnight, protesters were blocking the outbound lanes of Interstate-277, according to Joe Bruno of WSOC, who says that highway accesses Uptown Charlotte, the heart of the protests, and is used by those who would need to travel to adjacent neighborhoods. Protesters earlier used metal barricades to block off advancing riot police threatening them with arrest if they did not disperse. Police in riot gear were earlier blocking the Omni Hotel in uptown Charlotte, according to WCNC. BREAKING transit center in Charlotte just shut down... nothing coming in or going out. Ely Portillo, a reporter with the Charlotte Observer, reported being told, "Your life is in danger, you need to move!" by police in riot gear. Amy Wood, a reporter with WSPA, reports that the city's transit center has been shut down. Ty Chandler, a reporter with WCNC, tweeted photos of a looted Hornets basketball team clothing store near the Spectrum Center arena. She later tweeted that protesters threatened her and her media crew with property damage if they did not leave the area. A WLTX news reporter and photographer were reportedly punched and tackled "by agitators" and taken to Presbyterian Hospital in downtown Charlotte. Joe Bruno of WSOC reported that Charlotte Mayor Jennifer Roberts confirmed White House and Department of Justice officials will be in Charlotte Thursday. North Carolina Governor Pat McCrory announced via Facebook that "Upon a very recent request of Chief Putney, the State Highway Patrol is sending in troopers to further help the Charlotte Mecklenburg Police Department." "The state has many additional assets nearby to assist," McCrory added. "Any violence directed toward our citizens or police officers or destruction of property should not be tolerated. I support and commend the law enforcement officials for their bravery and courage during this difficult situation." Later in the evening, McCrory declared a state of emergency and announced national guard troops were being deployed. WBTV's Ben Williamson tweeted a photo showing a window shattered at a Bank of America. Bank of America, which is headquartered in Charlotte, has told its employees they do not have to report to their offices on Thursday. There are also reports of windows being broken at a nearby Hyatt hotel, and a sign has reportedly been put through a window at a Buffalo Wild Wings restaurant. A sign was also smashed through a window at the Nascar Hall of Fame. Firefighters have put out small fires set by protesters, according to WSOC's Joe Bruno. Coleen Harry of WBTV tweeted video of trash set on fire.